Frances Jeanette Wimmer Burnside, 80, passed into her eternal rest from cancer on Thursday May 30, 2018. 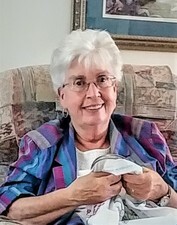 A graduate of Check High School in 1955, she worked her early professional life at Shenandoah Life Insurance Co. in Roanoke. She married the late Newton Joseph Burnside Jr. in 1978. When Joe became pastor at several churches she became music director, first at Oak Grove Assembly of God, Faith Assembly of God and Later co-founded Blue Ridge Chapel in Floyd. She was also active for many years in Waverly Place Baptist Church in Roanoke. Preceding her in death were her beloved husband, the Reverend Joseph Burnside, her father Harless Wimmer, sisters Claudie Mobie Wimmer, Nadine Vogel and Amy Wimmer, brothers-in-law Wayne Austin and Walter Vogel. Survived by Mother L.Z. Epperly Wimmer, children Jo Ann and Jerry Burnside, sisters and brothers-in-law Bobbie and Buddy Poff and Linda and Shelly Rosenbloom, brother and daughter-in-law Mike and Melissa Wimmer and many in-laws, nieces, nephews, friends and neighbors. Funeral services will be held Saturday, June 2 at 2:00 PM at Gardner Funeral Home in Floyd, followed by interment at Huffville Cemetery. Visitation will be before the service beginning at 1:00PM. Flowers will be appreciated, or memorial donations can be made in her honor to Eastern Appalachian Teen Challenge which helps trouble and disadvantaged youth address 5720 Williamson Rd. Roanoke, VA. 24012. The Family wishes to thank all her doctors, nurses, caregivers, friends, neighbors and especially the Hermitage of Roanoke for the excellent care she received and a special thank you to Susan Painter for going above and beyond for Jeanette and our family. Online condolences may be made http://www.gardnerfuneralhomefloyd.com or on Facebook @gardnerfuneralhomefloyd. The family is being served by Gardner Funeral Home.